Luke Williams says it was an "easy" decision to suspend the Swindon players seen appearing to inhale nitrous oxide in a video posted on social media. 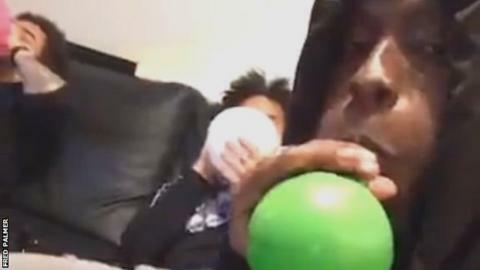 Midfielders Drissa Traore, 24, and Jeremy Balmy, 21, have apologised after being pictured using the legal high, more commonly known as laughing gas. Full-back Brandon Ormonde-Ottewill, 20, was the third player suspended. "It's something that I've taken very seriously and that I've been deeply stressed about," boss Williams said. "As soon as we'd been able to gather enough evidence to see the severity of it, it was an easy decision for me to immediately suspend the players." Williams also said that the club's investigation into the three players might not be resolved until after Swindon play Bury on Saturday. "I want us to be on the front pages of the national papers, but for football reasons and not for ill-discipline or anything else, so it's very distressing to me," he told BBC Wiltshire. "I think it's more important that we address this matter properly rather than panic and bring the players back before we've had a thorough investigation. If that takes longer, it takes longer." Swindon are 16th in League One, having failed to win any of their last seven games.